Learning the basics of counting outs is another step on your poker journey to becoming a proficient player. Did you ever wonder what is all the maths that professional poker players seem to be doing in their head? Counting outs is just basic addition and multiplication. So what is an out? An out is any card that will improve your hand to one which is better than your opponents. A simple example is when you have a flush draw such as A♥ K♥ of hearts on T♥7♥2♠ – you currently only have Ace high but any heart will give you a flush. There are 9 hearts in total which will complete your draw however one of those hearts (2♥) may give your opponent a full house. You can also hit an ace (A♠, A♣, A♦)or king (K♠, K♣, K♦) but these cards aren’t always guaranteed to give you the best hand. For example if you have a flush draw you will have 9 outs, if you have a gut shot you will have 4 outs, and with an opened ended straight draw you have 8 outs. A table below summarizes each draw with number of outs and pot equity. Now that you know how many outs you have you need to actually use that number There is no point in calculating your outs if we aren’t going to use it in our decision making process. This rule is pretty simple. To work out your equity or chance of winning when seeing the turn you multiply the number of outs by 2. Thus if we have 9 outs we will multiply that by 2 to get 18% equity. For example if we are on the turn and want to know our chance of hitting by the river this is the method we would use. To estimate your equity or chance of winning when on the flop you multiply the number of outs by 4. Again, if we have 9 outs we will multiply that by 4 to get 36% equity. For example if we are on the flop and want to know our chance of hitting by the river. The rule of 2 and 4 is only an estimation for our equity but it is usually accurate giving our equity to within a percentage point or two. Part of counting your outs is understanding if you are ahead or behind (and by how much) so it is important to understand your opponent’s range. For more information on ranges see the following link. When we know our equity we can make a decision whether our hand is worth continuing with. One must always be careful not to double count outs. With a big draw such as a straight and flush draw we will have 9 outs to the flush and 8 outs to the straight. However, of the straight draw outs there will be two which also complete the flush; thus we must remove these double counted outs. One interesting hand type is the double gutter. A double gutter is as the name suggests a double gut shot. An example is when you have JT on AQ8 board. Any 9 or K will make you a straight. A double gutter can sometimes be difficult to spot, even for experienced players. However, that makes them more powerful than other draws, as when you hit your hand it is more disguised. A more disguised hand is more likely to get paid off when you hit. Another interesting hand type is the ‘monster’ draw. These are draws with typically 12 or more outs such as a flush draw + straight draw, or a flush draw plus pair type hand. These hands have so many outs that it almost never wrong to commit all your chips (given you have a reasonable stack size). The most powerful of all these hand types is the open ended straight flush draw- J♥T♥ on Q♥9♥5♣. 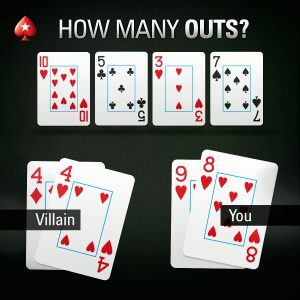 With this hand, not only do you have a flush and a straight draw but you have two cards which are the absolute nuts – you cannot ever be beaten if you hit the K♥ or the 8♥. The importance of these 2 outs cannot be underestimated. One issue with monster draws is that the rule and two and four begins to break down- the rule overestimates the equity. Although there will be very few situations where you will be folding a big draw. How many outs do we have here? Our opponent has 44 and we have 9♥8♥ on T♥5♣3♥7♠ board. We have two overcards to our opponent so that is 3 outs for the 9 and 3 outs for the 8 for a total of 6. We have a J and a 6 to complete our straight which is 4 each for a total of 8. We also have a flush draw of which there is 13 hearts in total. We have 2 of them hearts, our opponent has one and there are two on the board. That leaves 8 hearts. That gives a total of 22 outs.. However we have double counted some of the outs. The 6♥ and the J♥ are counted in the flush and the straight counts we made. We should only count them once meaning that we now have a total of 20 outs. Using the rule of 2 and 4, we know that we have approximately 40% equity since we are on the turn. That means we should be calling almost any sized bet on this turn if we knew our opponent had a pair of 4’s on the board. Another aspect we need to take into account is that not all outs are created equal. Outs to the nuts (the strongest hand possible) are always the most sought after type of outs; unfortunately we won’t always have outs to the nuts. In most cases we will count our flush draw out as a normal out but it can complete a full house for our opponent. Take for example our opponent has 77 on T♥7♥2♠: we will count the 2♥ as an out when we have a heart flush draw. However, it will improve our opponent’s hand at the same time as ours; unfortunately for us that will be to a full house which beats a flush. We will lose a lot of money in this example. A further example of drawing to not nutted outs is the ‘dummy’ or bottom end of the straight. When we have the bottom two cards of a four to a straight, for example 87 on T95 flop, we will be dominated by a hand such as KQ; if a jack hits we will both complete a straight but KQ will have the nut straight, beating our lower straight. As such, drawing to the upper end of the straight is much more powerful. Although, it is not always possible to avoid drawing to the dummy end of the straight. However, take into account they are less powerful than other straight draws and hence you should be less likely to proceed with them vs betting action. We can apply a similar thought process to overcard outs: AK on T52 board. If we hit our Ace or King on the turn we may not still have the best hand. Someone may have a set or two pair already or they might make two pair with the card which helps us. Counting outs is not the most difficult of tasks a poker player must perform; however but it is one of the most useful. If you know how to count and think about your outs you are well of some of the poker population. 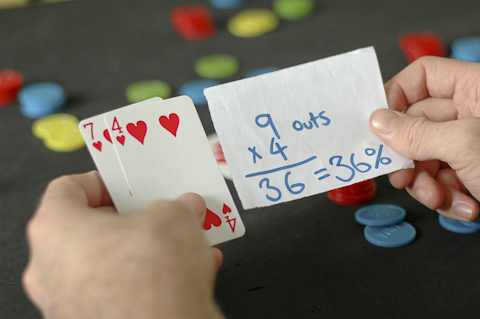 Counting outs allows you to understand how likely you are to win the hand. This allow you to decide whether you want to continue versus a bet or raise and hence make more informed decisions at the poker table. The more likely to win the hand, the less likely you should be to fold. Follow up this lesson with another on Pot Equity.